I had the idea that maybe buckwheaties would make a good substitute for rice krispies to make a healthy raw treat. Buckwheaties are sprouted buckwheat groats which have been dehydrated making them crispy. 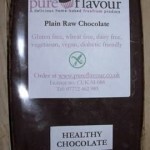 You can either make them yourself or buy them ready made (eg here at Funky Raw). First make the chocolate. 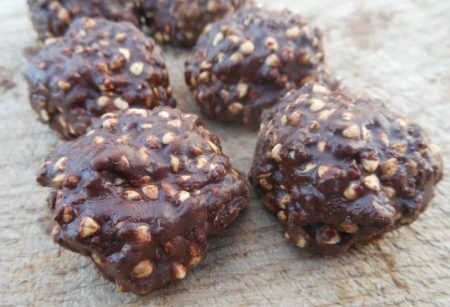 The ingredients listed make approximately 100g of chocolate, so you can make the same amount of chocolate using your preferred chocolate recipe, or even melt some ready made raw chocolate bars (a couple of Vanoffe Dark bars might work well). Melt the cacao paste, cacao butter and coconut butter. Stir in all the powdered ingredients and honey (or other sweetener of your choice, or leave it out completely if you prefer). Mix in the buckwheaties and form into balls. This is the messy part – hopefully the chocolate is starting to set a little by now which should make it easier! 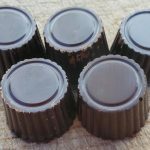 Maybe you could try spooning the mixture into paper cake cases if you don’t want to get messy chocolate coated fingers, although surely licking your fingers at the end is part of the fun! With these quantities I made 7 balls, although they were a little bit too big so you could make them a little smaller and make 8 to 10. This should also work well with activated pumpkin seeds, something I will try soon! Or even a mixture of pumpkin seeds and buckwheaties… Let me know in the comments if you come up with a good variation.